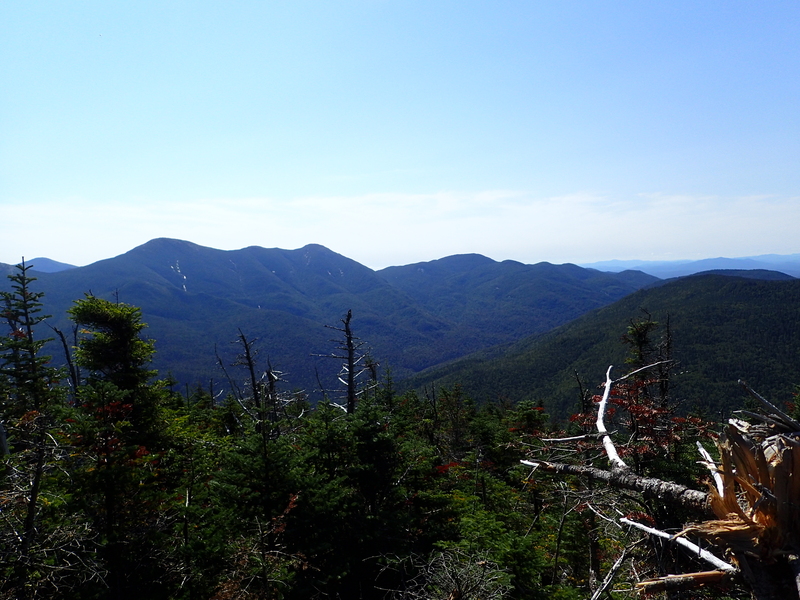 Over the Labor Day weekend I felt like it was time to get back to the High Peaks after spending so much time in the White Mountains and other places the last couple of months. However, since it was a holiday weekend with perfect weather, I knew we had to pick something a little less popular to hike in order to avoid most of the crowds. Since Kelly still hadn’t completed Street and Nye I figured this was as good a choice as any. We got to the Loj at about 6:30 am and by that time the parking lot was almost already halfway full so I knew we made a good choice in starting early and also picking a less popular objective. After gathering our things we hit the trail in no time and made our way over towards the trailhead by the entrance booth for Heart Lake, Mt Joe, and beyond. 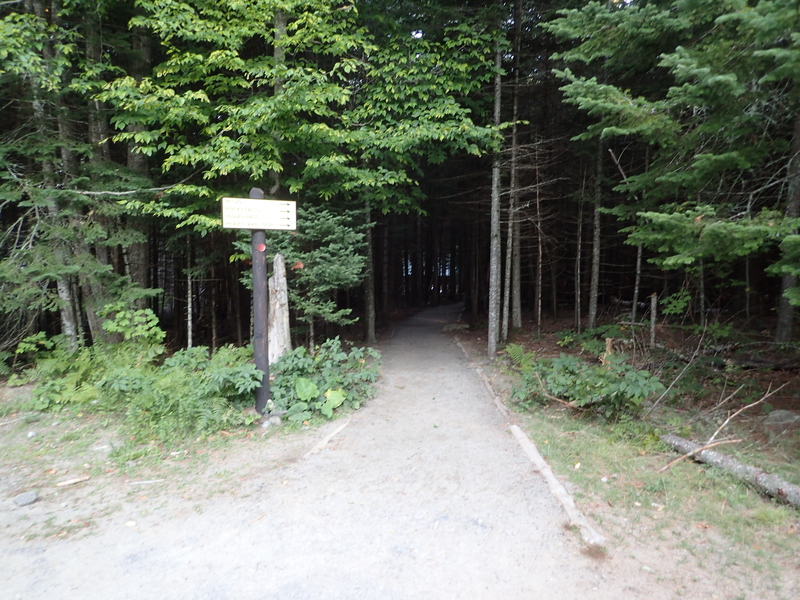 The starting trail from the parking lot near the entrance booth. At the start of the day it was about 41 degrees and chilly but there was hardly a cloud in the sky and we were expecting highs near 75 later in day so it really couldn’t get any better for hiking. 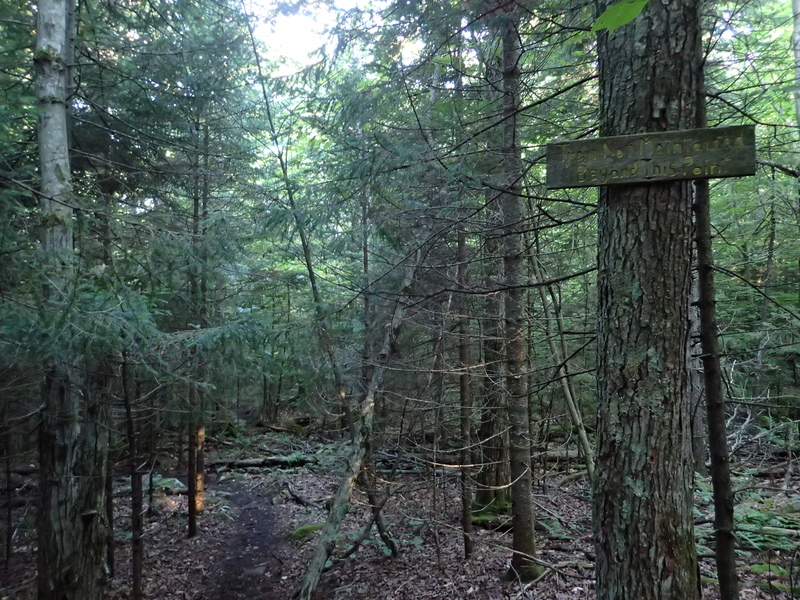 The “trail” at this point is really just a series of gravel paths that lead you around the Loj property and towards the woods on the other side of Heart Lake. They are easy to follow if you just read the signs and keep heading in the right direction. At the first junction you want to hang a right towards Mt. Jo and Indian Pass. First junction right at the start of the trail. After another short distance you will come up on the next junction. 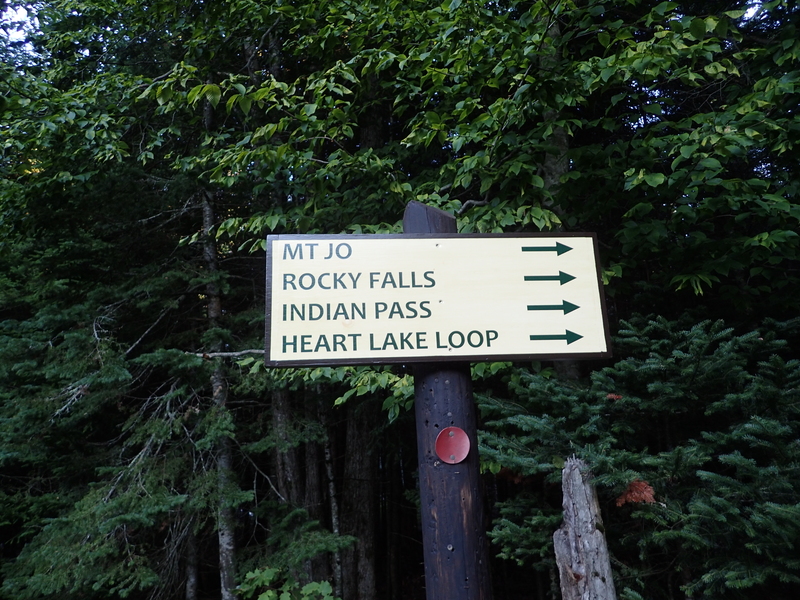 From here you want to stick to the left towards Rocky Falls and Indian Pass. 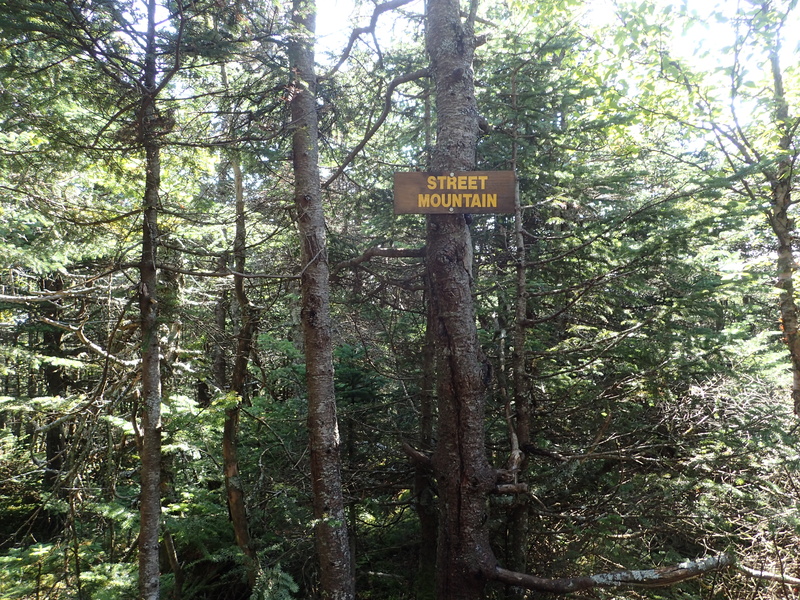 Although it is possible to hang a right and go up and over Mt Jo before heading towards Street and Nye if you were looking to add some extra miles to your hike. A short distance past this junction you will also see little paths leading to benches and beautiful views over Heart Lake. 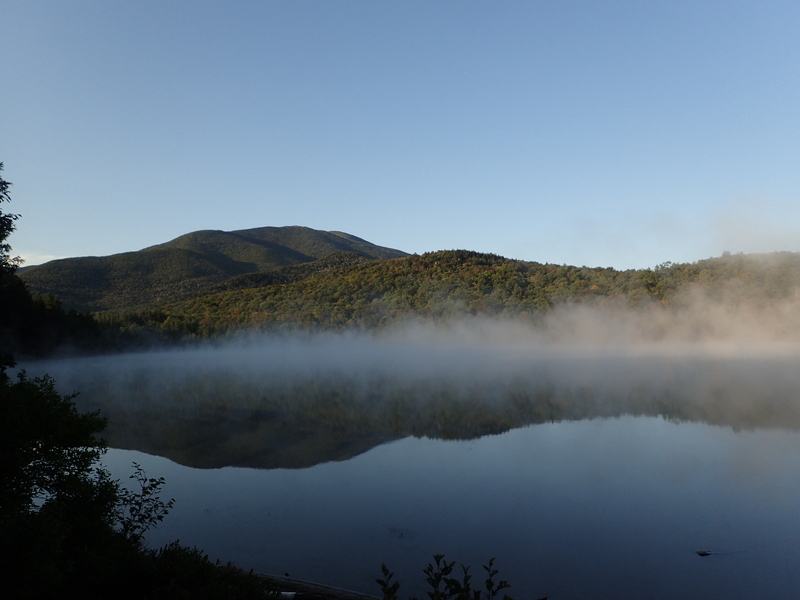 On this particular morning there was a light fog over the lake as the sun rose which really made for a cool effect. Looking out over Heart Lake really never gets old. Looking out over Heart Lake. View of the trail just past the Trail Register. 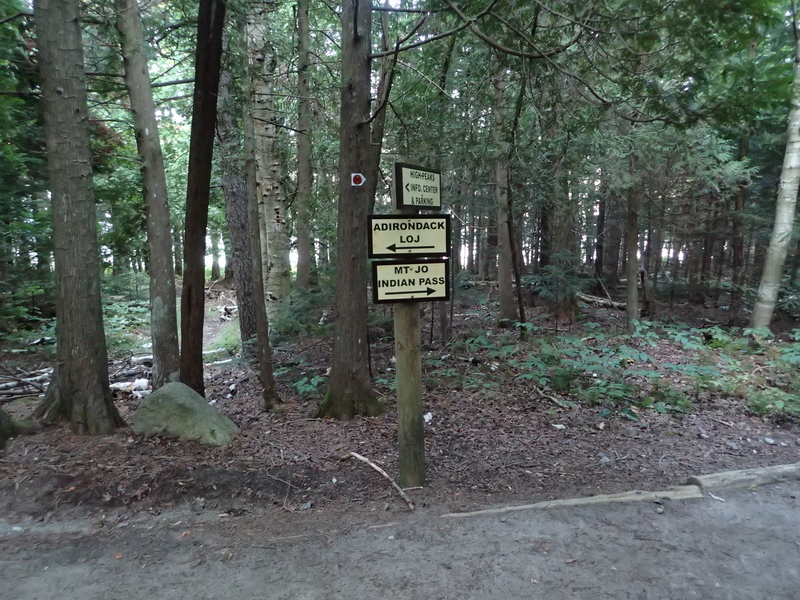 After just another short distance you will come to the next junction for the Old Nye Ski Trail and Mt Jo via Rock Garden Trail. You want to hang a right down this trail which will lead you towards the start of the herd path for Street and Nye. I was happy to not make the same mistake of walking past it like I did last time. It was also nice that up to this point there were only a couple of groups signed in ahead of us for Street and Nye and otherwise not many people were out on the trails yet. The junction where you make a right towards the start of the herd path. After turning down the trail it was only another short distance before we reached the next junction with the start of the herd path for Street and Nye. 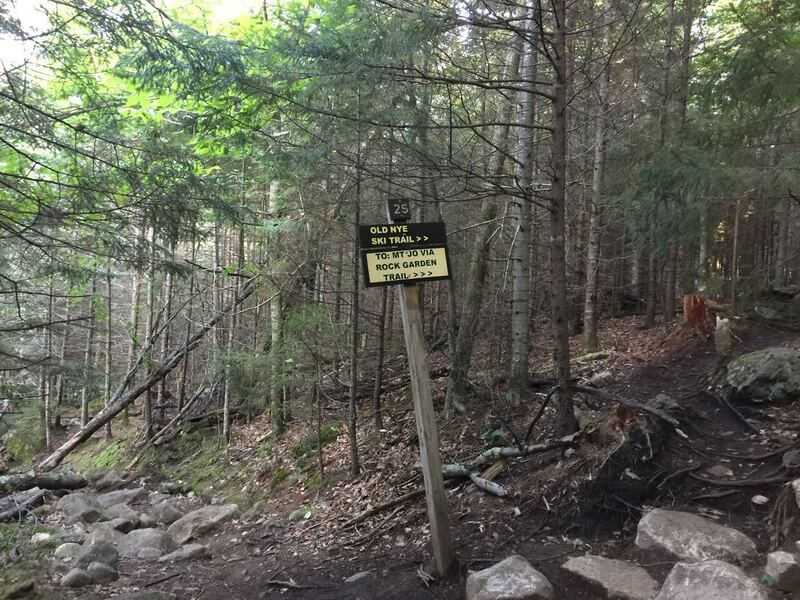 Technically the trail for Street and Nye is an unmaintained herd path which means there are no official trail markers or regular trail maintenance. 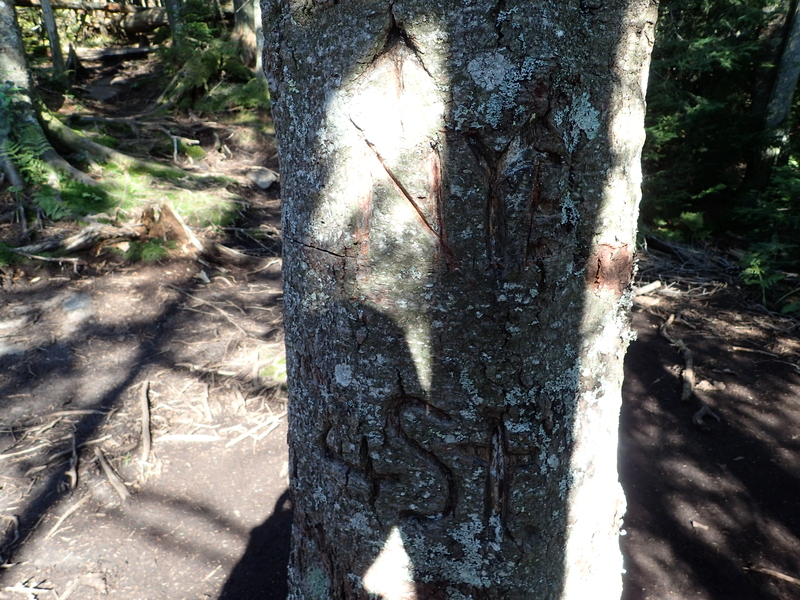 However, being that the trail is still pretty well traveled it is well worn and generally easy to follow. 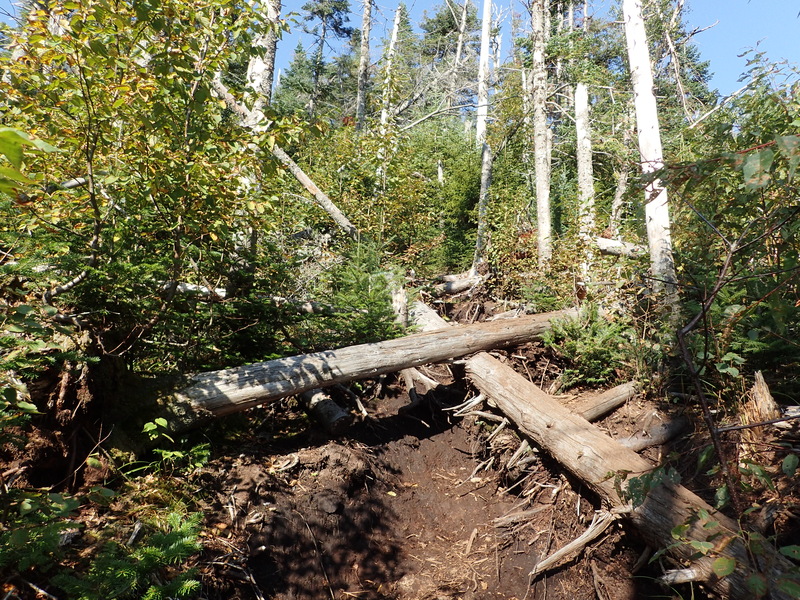 In parts there is a lot of debris to navigate such as logs and the like but if you are paying attention you shouldn’t have any problem staying on course. Junction for the start of the herd path. You want to keep walking straight ahead. 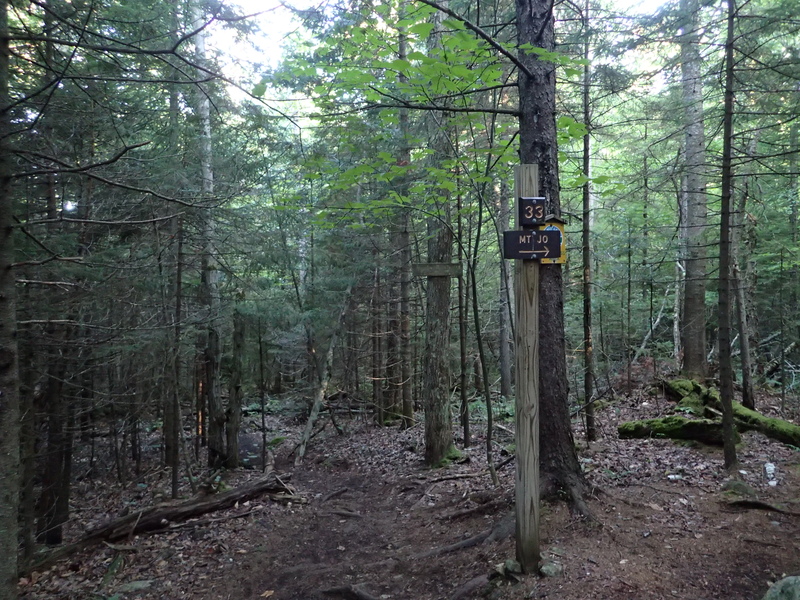 Sign letting you know your walking on to unmaintained trail. 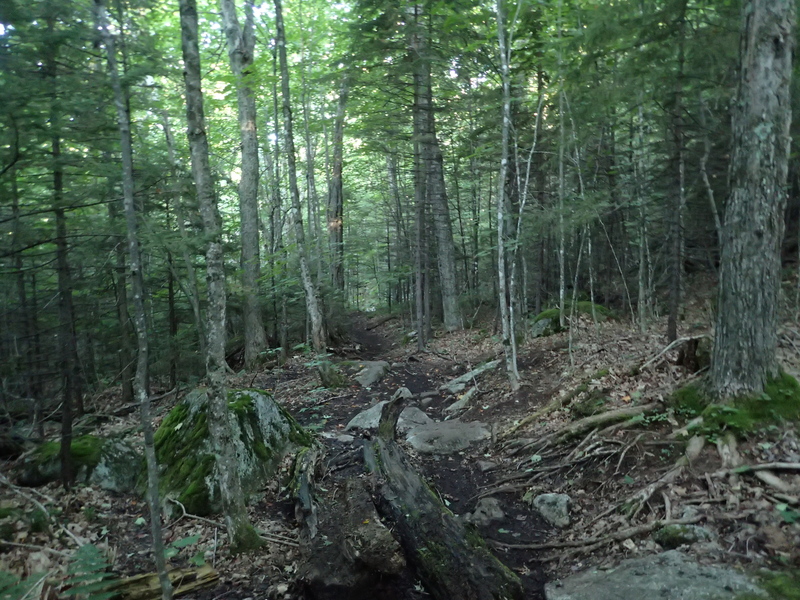 The trail after the junction was mostly flat and boring as it wound its way through the woods and towards Indian Pass Brook. Luckily for us the trail was mostly dry and mud free which made for quick progress towards the brook. View of the herd path heading towards the brook. 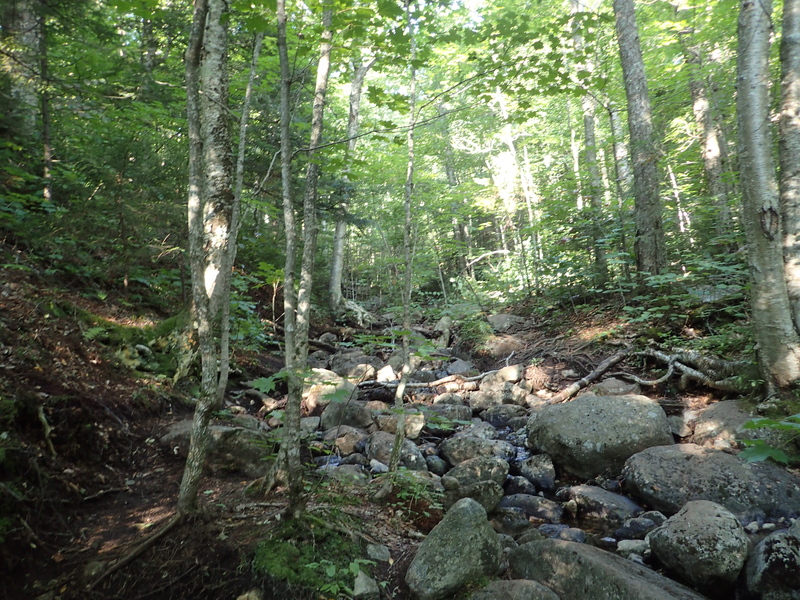 The trail as you approach the brook. 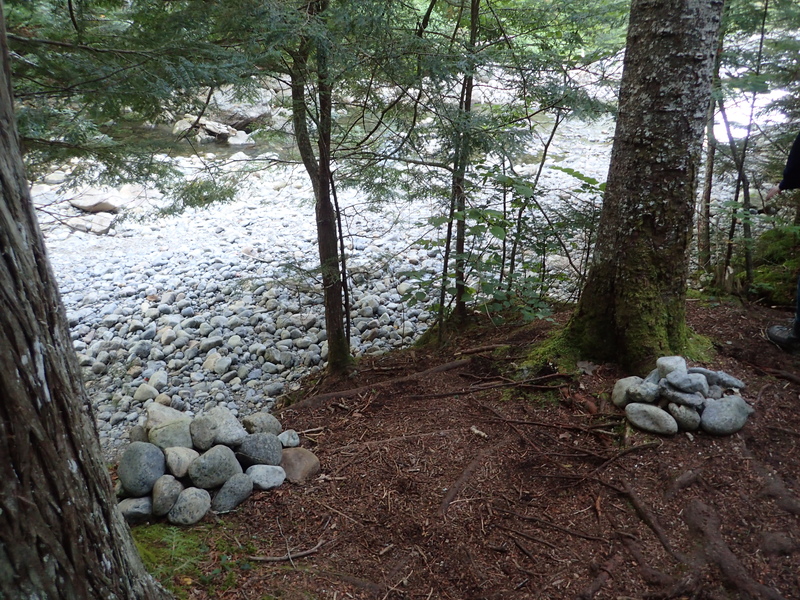 Before too long we reached the bank of the Indian Pass Brook and the crossing location which is marked by a couple of cairns on the side of the brook. The last time I came this way the brook was flowing pretty heavy so it was necessary to take my shoes off and wade across in water up to my knees but this time around it was very dry so hoping across the rocks was no problem at all. Cairns marking the location of the crossing. Looking across the brook. 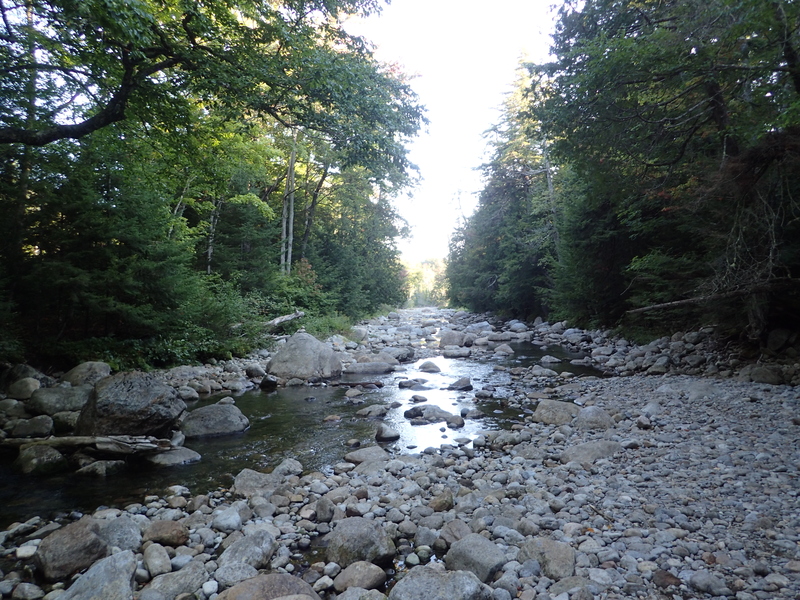 With a hardly flowing Indian Pass Brook. 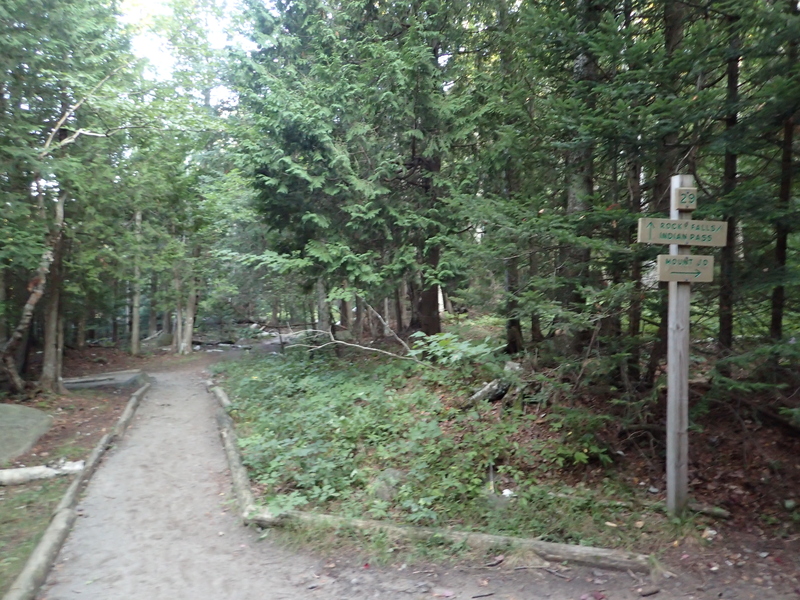 After crossing the brook while staying nice and dry we continued along the trail towards our goal of Street and Nye. 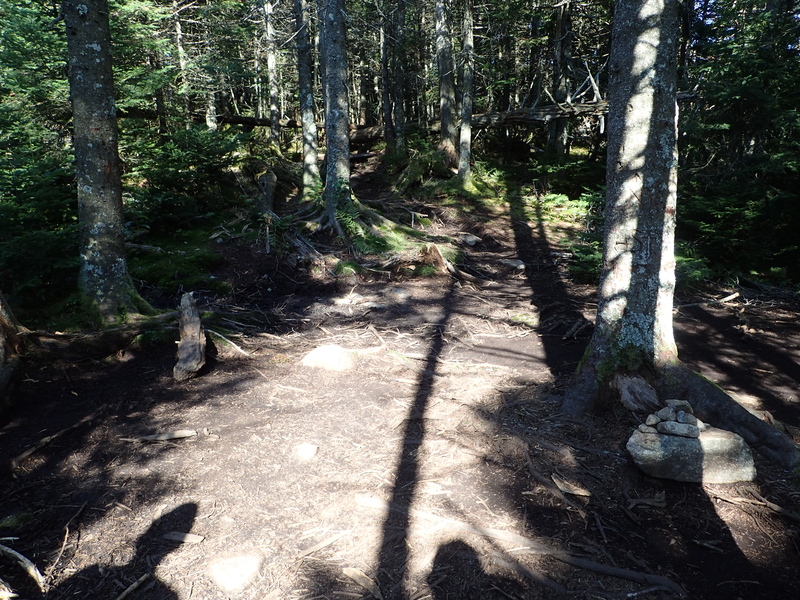 A small cairn marked the trail as it headed up a hill right on the opposite side of the bank from where we crossed. 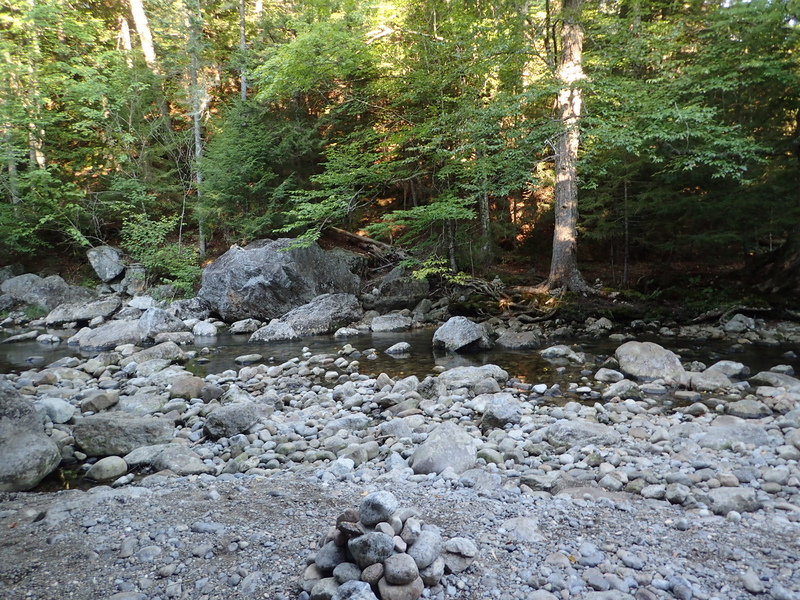 Cairn marking the trail after crossing the brook. From here the elevation gain of the hike also began as the trail pushed ever upwards at a pretty easy grade towards the ridge for Street and Nye. 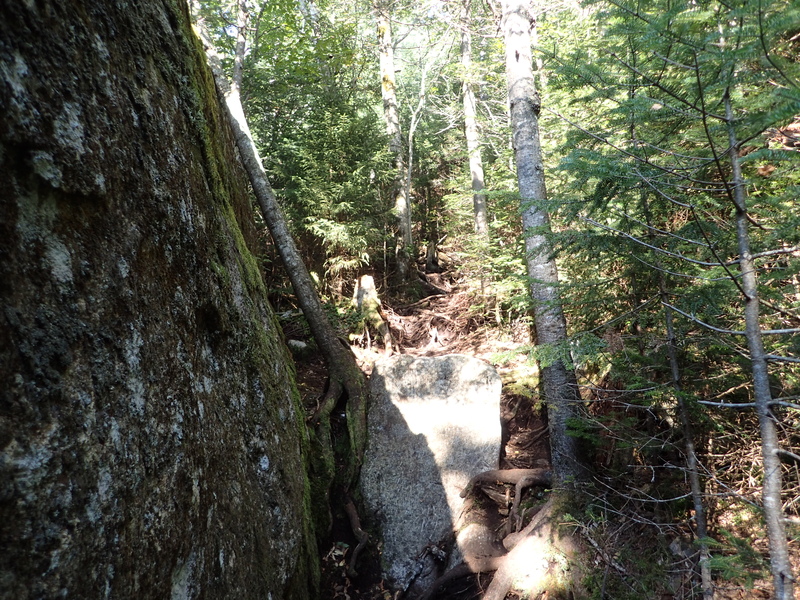 The trail also became more root covered and rocky but we were able to maintain a steady pace as it leveled out from time to time between inclines. Before too long we came to the next brook crossing. Normally there are logs in place for crossing this section when the water is high but on this day you could just walk across as if it were just a puddle. The trail to herd path to Street and Nye is kind of dull in terms of exciting scrambles and the like but it was still a pleasant and quiet hike. Up to this point we still had not run into anyone else so it really felt like we had the place to ourselves. 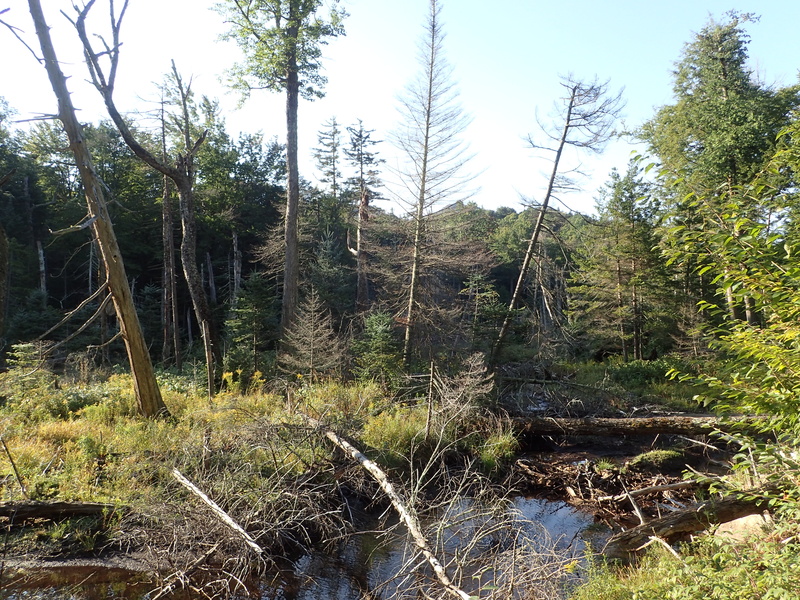 View of a bog off the side of the trail. View of the herd path as we worked our way up. 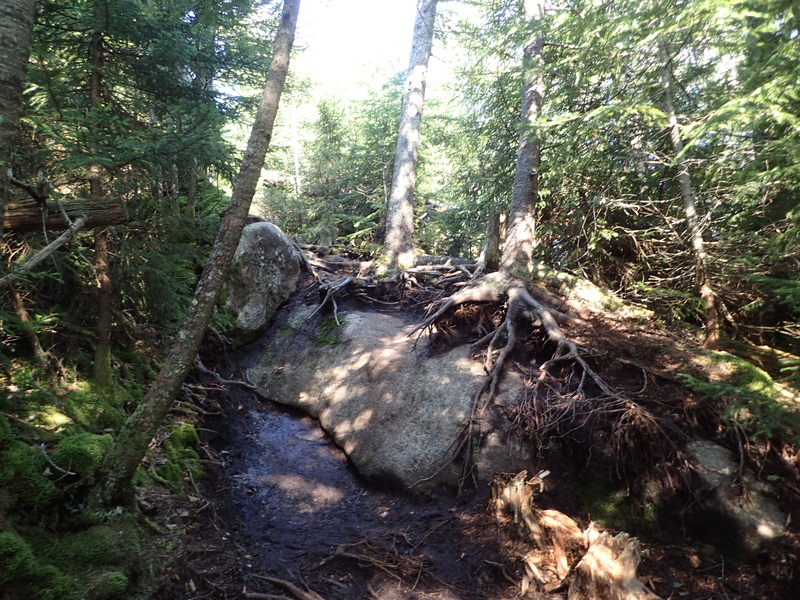 After a while we reached another small brook which we crossed over and began the real push upwards. 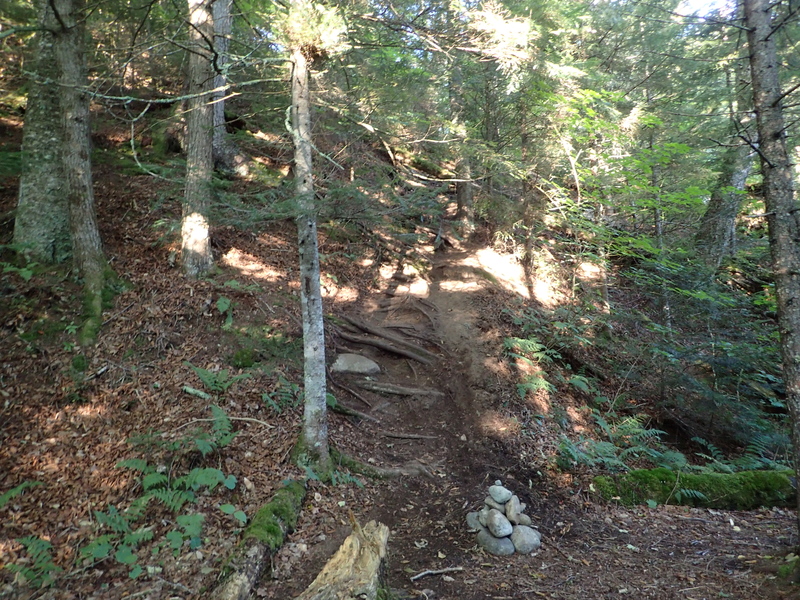 At this point the trail follows along and in the brook as you work your way up the path of least resistance towards the top of the ridge. At the water crossing we also spotted some vintage Adirondack artifacts which were pretty neat. 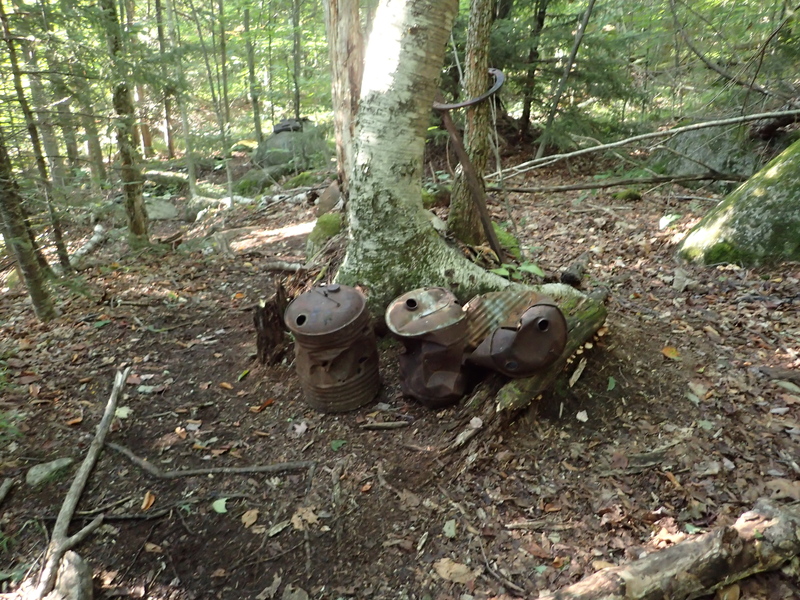 Some artifacts off the side of the trail. 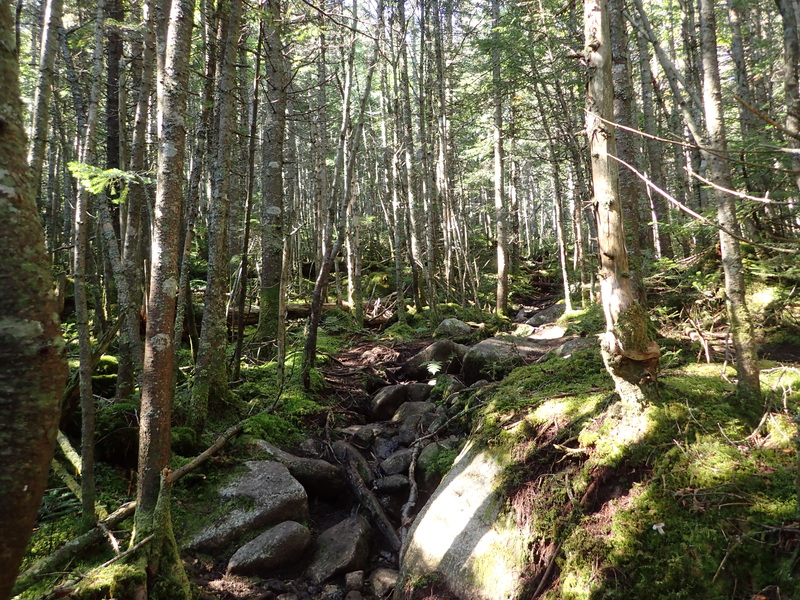 I remember from my last trip up Street and Nye that this section of trail was incredibly muddy but since there was hardly any water flowing it was actually pretty dry and we were able to make quick progress as we worked our way up the brook. 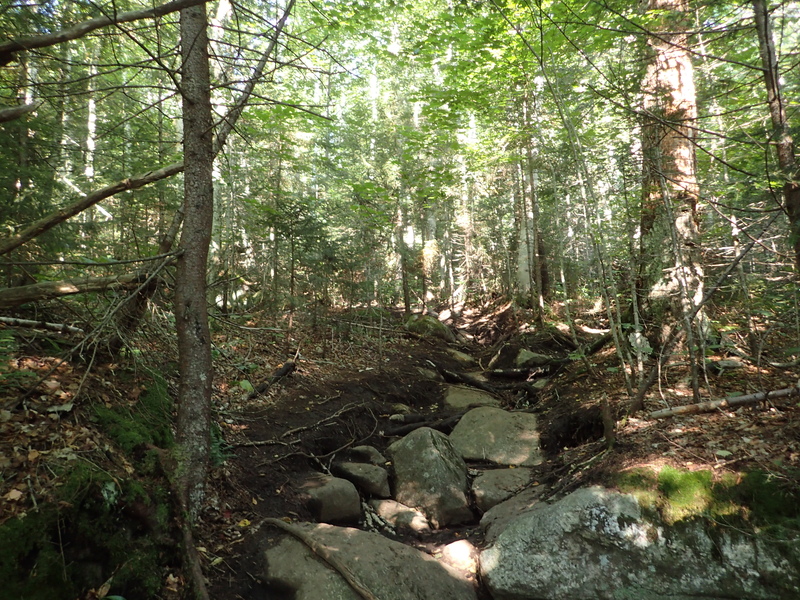 View of the trail as it follows the brook. 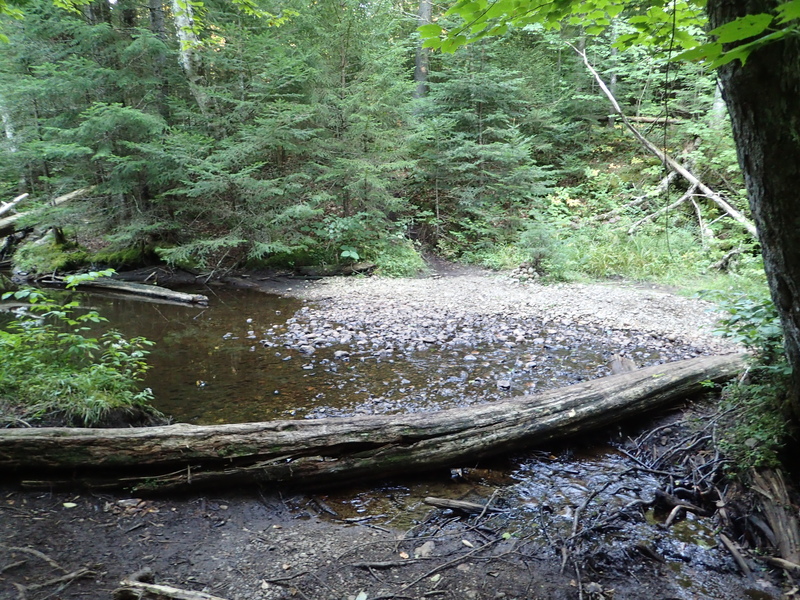 Eventually the trail moves away from the brook and back into the woods towards the ridge as the brook turns into little more than a trickle. 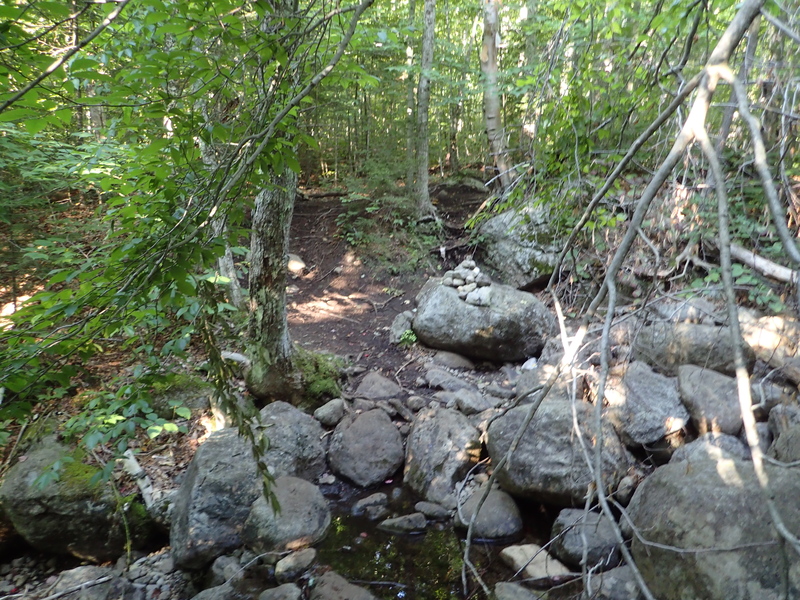 Rocky sections of trail as you work your way back into the woods from the brook. The trail at this point also got much more root covered and slippery in parts despite there not being much mud at this point in the day. 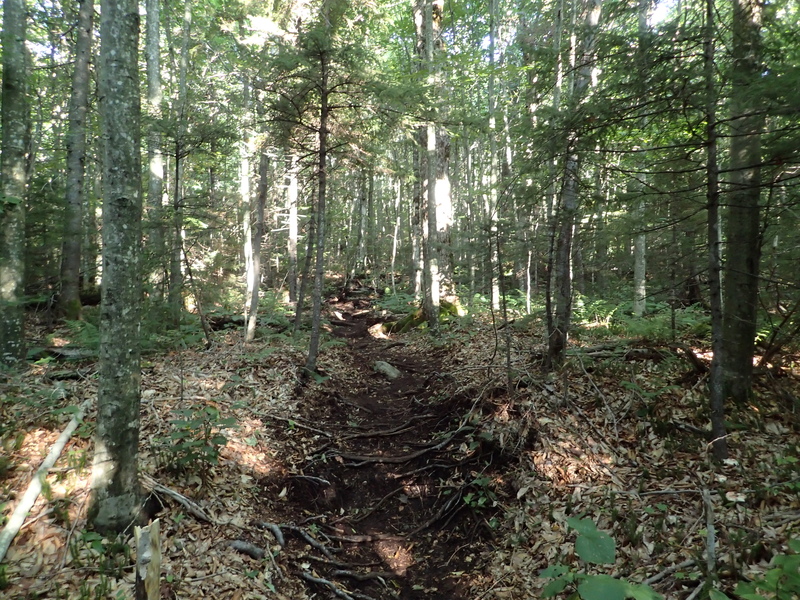 View of the root covered trail. After a while of a pretty steady grade we could tell we were getting closer to the top of the ridge as the trail narrowed even more and got rockier as it leveled out slightly. View of the narrow trail as you approach the ridge and the junction for Street and Nye. Up to this point we were completely in the woods all day but as you near the top there is a nice rock right on the trail itself which offers a nice, albeit mostly obstructed view of the landscape beyond. It was a great place to look out and realize again just where we were. View looking out from the Street and Nye herd path. Although the view was short lived and right after we were back into the woods where the going got a bit tougher. From here the trail wasn’t so much steep as it was debris filled and wet. There was a fair bit of mud and what seemed like a million fallen trees you needed to climb over. I would also suggest you keep your eyes in front of you as there are a few low hanging trees which are perfect for hitting your head against. I can’t tell you why I know that but you need to trust me that it’s true! 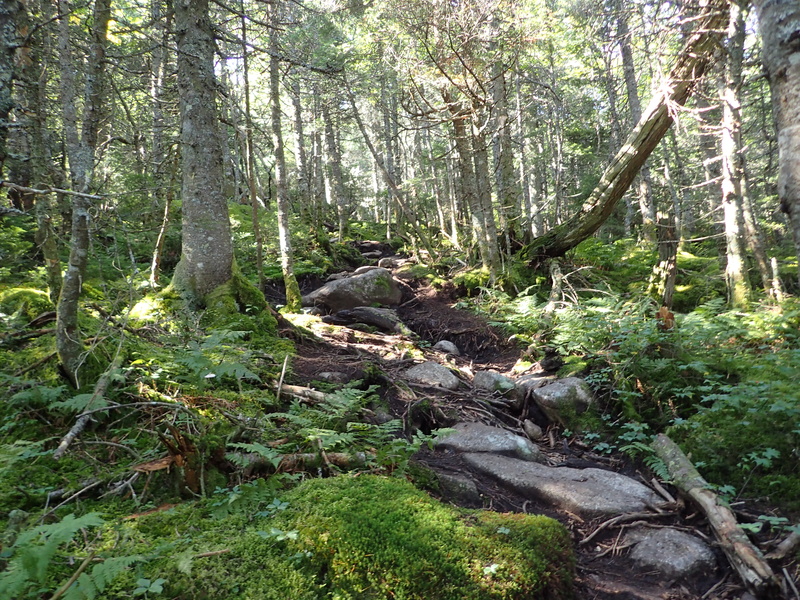 View of the wet and rocky trail. 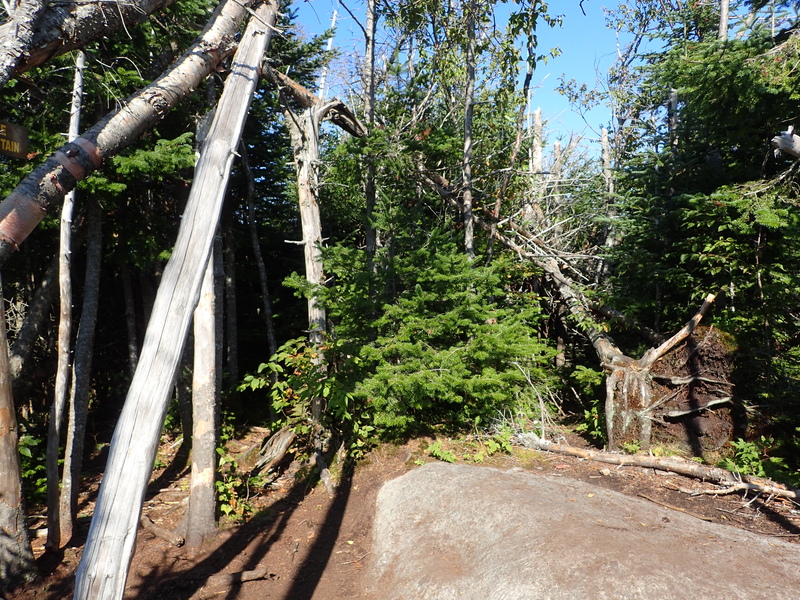 Some of the many fallen trees along the trail. After crossing this section we soon reached the junction for Street and Nye. From here it is approximately 0.3 miles to Nye and 0.6 miles to Street (one way) along easy to follow herd paths. Final junction separating Street and Nye. Marks in the tree letting you know which is which. Street is to your left and Nye is to your right as your coming up the trail. We decided to start with Nye since it was the shorter one and just get it out of the way. 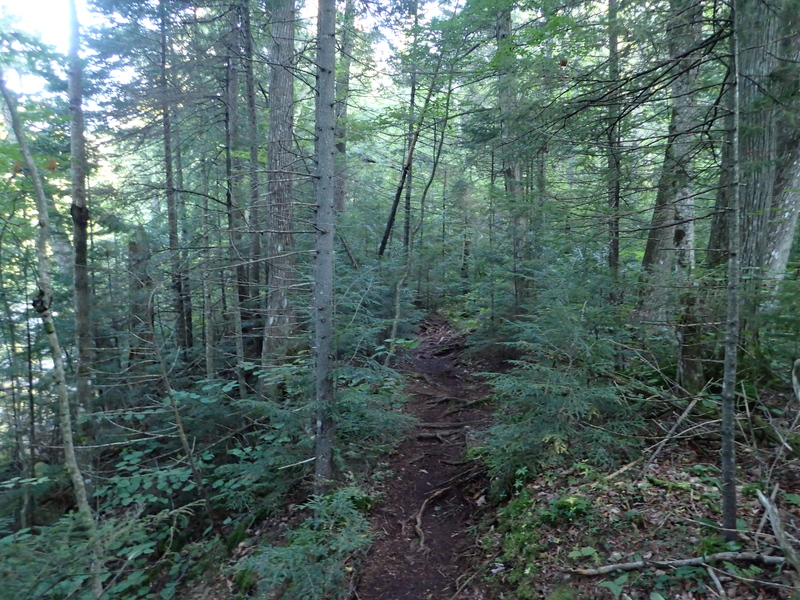 The trail was more of the same and pretty uneventful. Since it was so short we finished it in no time at all. Looking down the trail as we headed up Nye. 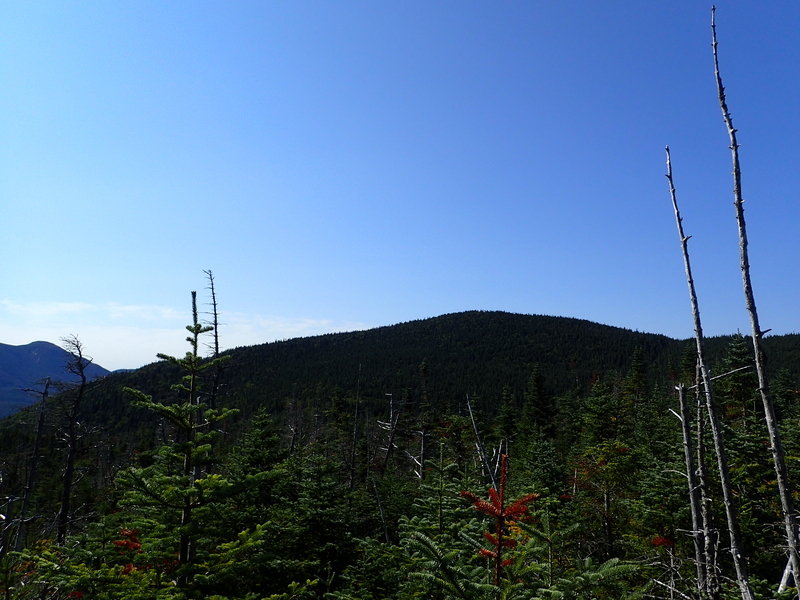 Although the summit of Nye is completely wooded there is a small rock just off the trail near the summit which offers some obstructed views off into the distance. They aren’t the best views but they are still pretty good, and certainly better than on Blake or Couch! 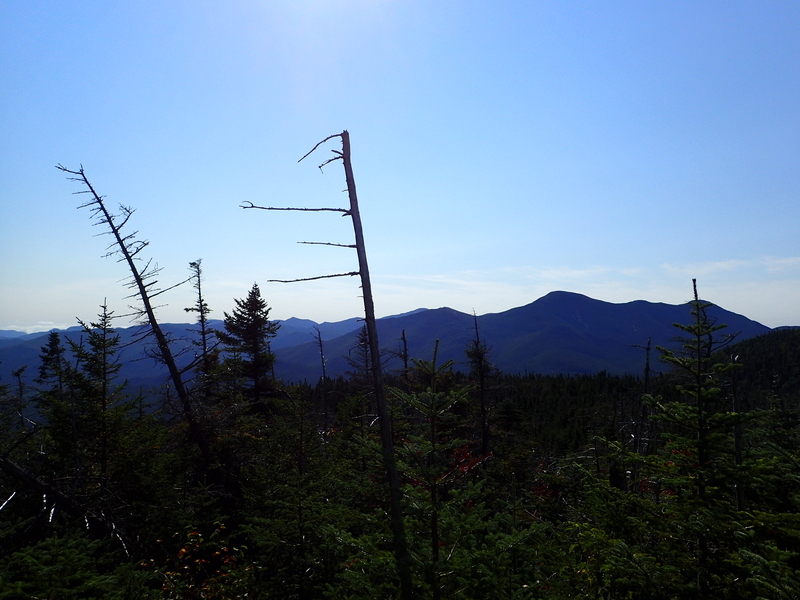 View from near the summit of Nye. Looking over Towards Street from near the summit of Nye. 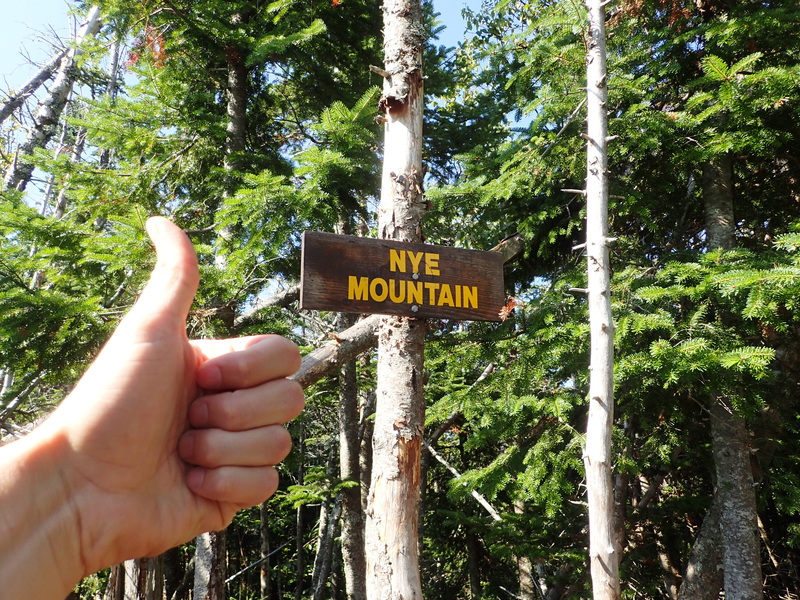 Sign marking the summit of Nye. We didn’t linger long before descending back down towards the junction and on to the summit of Street. The descent only took a few minutes and we were on our way to Street in no time. At this point we also ran into a few other hiking parties but overall it didn’t feel like anymore people than any other summer weekend which was nice considering the crowds we saw in the parking lot. I can only imagine how busy Marcy must have been on this particular day. 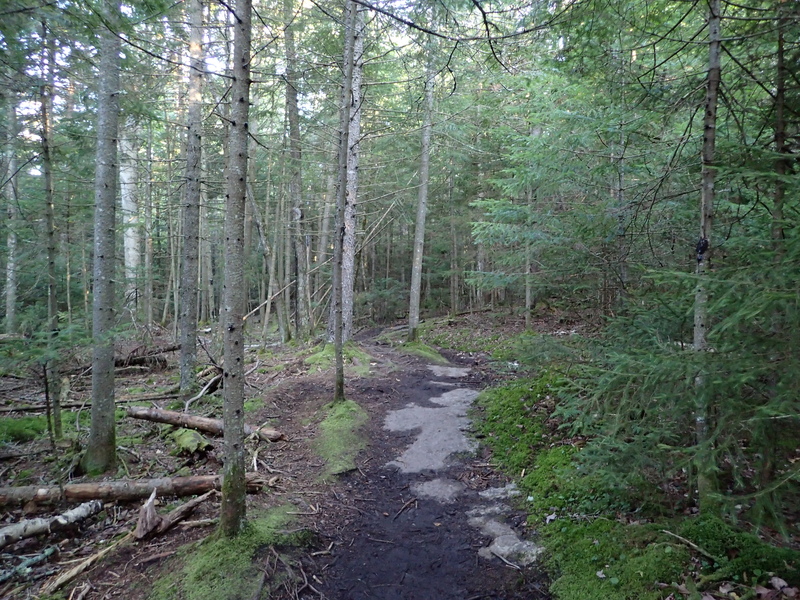 The trail to Street is actually much nicer than the one heading up Nye because it is full of beautiful green moss on either side. 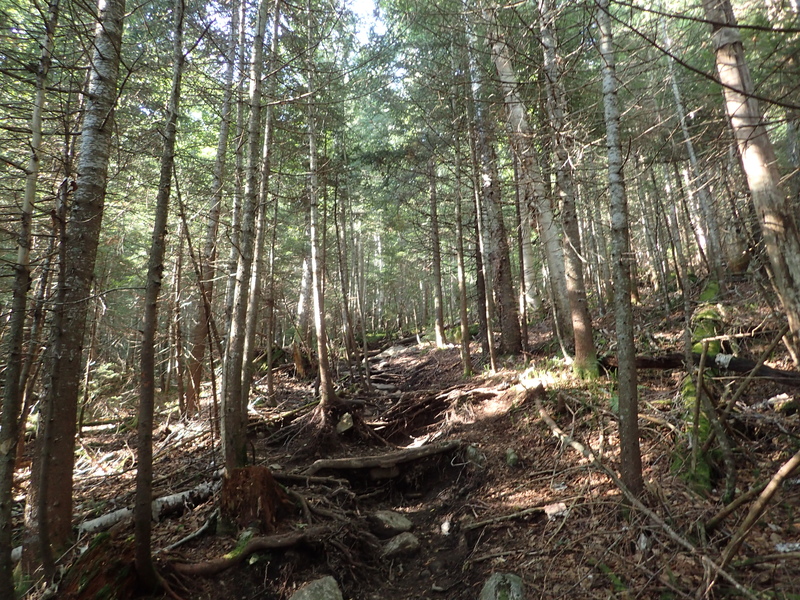 The trail was also bright and sunny in comparison which made for a pleasant section of hiking. Last time I hiked these peaks there was a slight coating of snow and frost so it was nice to see it in all its summer glory. View of the trail headed up Street. The trail itself wasn’t any harder than the rest of the trail up to this point so we were able to make quick work as we headed up towards the wooded summit. 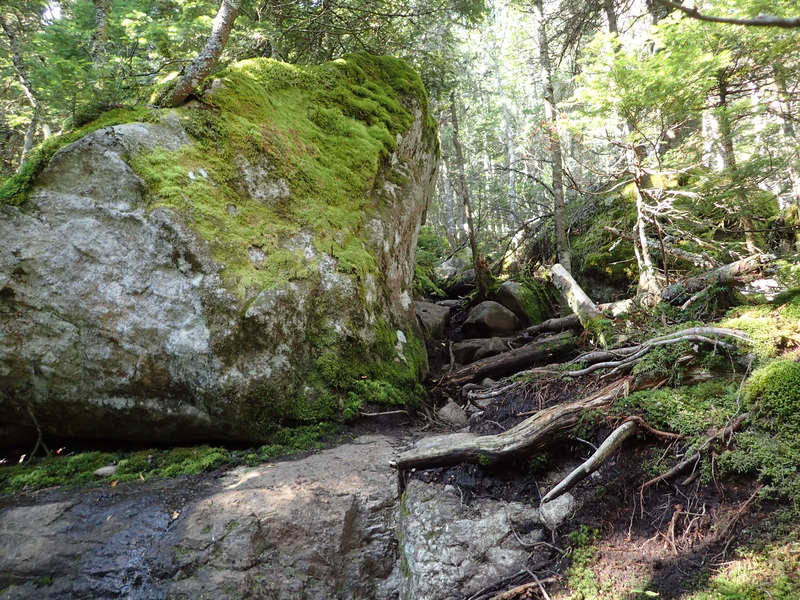 However, the bright green moss made it feel like we had begun hiking somewhere completely different. Trail as you near the summit of Street. The summit of Street, like Nye, is also a completely wooded summit. 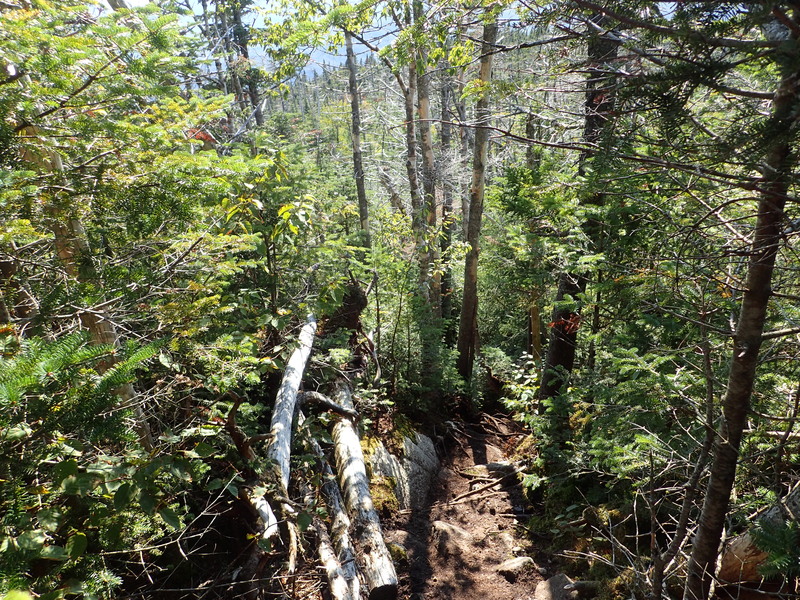 However there are some short paths leading away from the summit where you can get some clear views of the area. View from near the summit of Street. Sign marking the summit of Street. We hung out on the summit for a little bit while we had lunch and talked with a few others we saw before making our way back down the mountain. We hiked back out the same way we had come and it was mostly uneventful except that by this point the trails had gotten much muddier from all the people heading up so our progress slowed down a bit more than usual. I also managed to stop in the wrong place and when the mud gave way under my foot like I stepped on a banana peel, I took a nice backwards fall onto my elbow leaving me with a nice souvenir. Luckily there was no major damage besides a cut that didn’t want to stop bleeding so it didn’t slow us down at all. 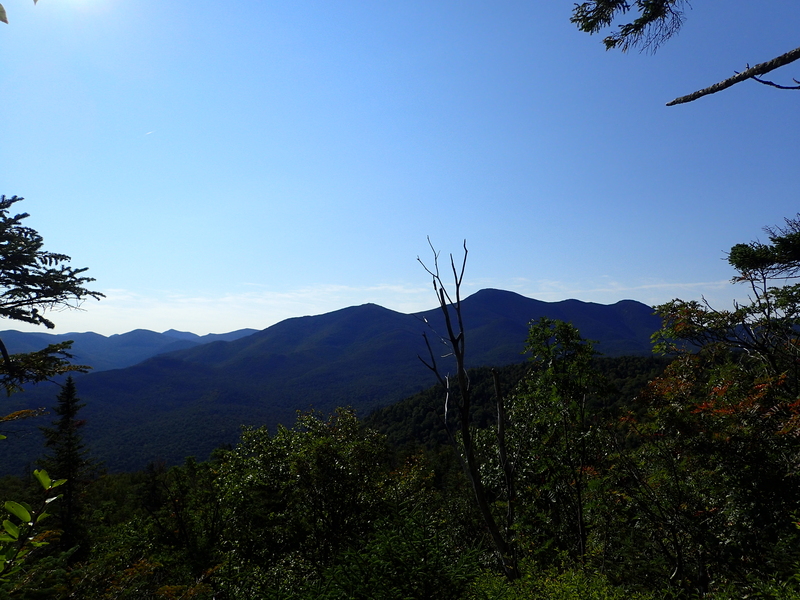 All in all it was nice to be back in the Adirondack High Peaks, even just to climb Street and Nye. Kelly also completed her 10th and 11th peak which was pretty exciting. These peaks may not be my favorite but they are also not the worst by any means so I am sure I will be back again soon at some point!